Atiku Abubakar to lead the People’s Democratic Party (PDP) to take back Imo State in 2019 elections, has advised the former Vice President and PDP Presidential aspirant to face his challenges and leave Imo politics alone. In a statement released on behalf of Governor Rochas Okorocha by his Chief Press Secretary, Mr. Sam Onwuemeodo, the Imo State Governor described the statement by Atiku Abubakar as an empty threat that can never be achieved. 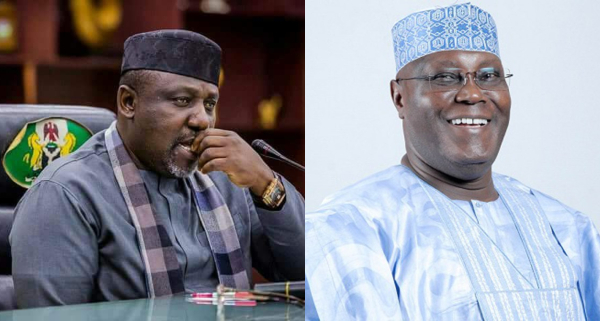 The statement which stated that Governor Rochas Okorocha will defeat the former VP in any election, even in his home state of Adamawa, also advised Atiku Abubakar to “leave Imo and Governor Rochas Okorocha alone and face his worrisome challenges”. ”And if he does not know, Governor Rochas Okorocha will defeat him in any part of the Country including his Adamawa State in any election involving two of them. He does not therefore have what it takes to lead any struggle that will return the PDP to power in the State or the Country in 2019. That promise was a false one”. It continued that, “the former Vice President Alhaji Atiku Abubakar was in Owerri for a meeting with the stakeholders of the PDP in the State over his presidential ambition. “While meeting with the PDP Stakeholders in the State, he was reported to have told them that he would lead the struggle for the PDP to take over Imo and Nigeria in 2019. He also tried to run down the governor, Owelle Rochas Okorocha and his government. “What we do not take from anybody is blackmail against the government of Rochas Okorocha. We would do our best to set the record straight. The former Vice-President would have done his meeting without scratching the governor and the government he heads in the State. And that is where we come in”. The statement also read, “the former Vice-President therefore leave Imo and Governor Rochas Okorocha alone and face his worrisome challenges. And if he does not know, Governor Rochas Okorocha will defeat him in any part of the Country including his Adamawa State in any election involving two of them. He does not therefore have what it takes to lead any struggle that will return the PDP to power in the State or the Country in 2019. That promise was a false one. “To say the least, that promise of returning Imo to PDP was very deceitful knowing full well that in 2011 Rochas ran on the ticket of APGA that had no structure on ground and defeated an incumbent PDP governor with a very wide margin. In 2015, he took the soul of APGA to merge with other parties to form APC and defeated two powerful Candidates of PDP and APGA, even with the PDP Candidate having the Federal might behind him. Interestingly Alhaji Atiku Abubakar was not in exile when all these happened. “Imo PDP is dead. The monumental achievements of Governor Okorocha in less than eight years have destroyed the Imo PDP because the Party has no claim again to make before Imo people. “When PDP was in power in the State the Imo Airport was an eyesore, but today it has become an International Cargo Airport with all the facilities available and Courtesy of Rochas Okorocha’s administration. The former Vice-President would have demonstrated statesmanship by commending Rochas Okorocha for that feat”. Furthermore, the statement pointed out that, “all the flyovers and tunnels Alhaji Atiku passed through in Owerri were not there when the PDP was in power for twelve years. The twelve and eight – lane roads the former Vice President saw in Owerri when he came were not there when the PDP held sway. The free education that has raised the school population of the State from 381,000 in 2011 to over one million in 2017, was not also there under the PDP. “Beyond the noise of few power seekers in the State, Imo people are on the side of Governor Rochas Okorocha because of the large extent he has developed the State. The projects are available for verification. Let Atiku ask the PDP in the State to publish their achievements for the twelve years they governed the State and let Rochas publish his achievements for the less than eight years he has been on seat, and the former VP will discover that PDP in the State is a goner. “And that is the reason all those who made the Party thick in the State have all left to join either APGA or APC. Today, all the former guber aspirants in the PDP are doing so in APGA including Chief Ikedi Ohakim. They have left the PDP for two people.